08-Feb-2009 -- I have heard about the Degree Confluence Project only a few days before this first try of a visit. I was very keen to see how it would work and how complicated it will be to find the accurate position. It was not very difficult to approach the location. By setting a waypoint in my GPS-program, I reached the area next to the CP quite fast. I had passed here several times before, when we went for diving at Cape Greco (which is a very nice spot with clear water and bright ground). The area of the confluence point is looking like an unsold plot, or like an unused public strip of land. 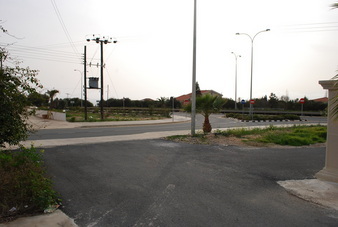 It is a piece of land next to the public pavement on a junction. While doing the pictures of my devices for the submitting procedure, I walked in circles with one to two metres diameter to find the correct point. On the correct place which I located like this, I stopped and waited until my devices calmed down. I say devices because I am using a smart phone which works with a GPS-mouse via Bluetooth. But the fourth digit behind the comma was still changing up and down. Caused by this I did many senseless pictures of it in hope that it would show to the correct figures within the next second. At luck we have digital cameras nowadays! But after a view minutes, I did two correct shots with the 0000 in the end of the decimal degrees! I was very happy! In case people in the private house next to the CP were watching me, they might have thought that I am not a very normal tourist. But I saw nobody there. I saw no pedestrian at all during my ‘exploration’. The other pictures where done much faster later on by using my normal compass.